W. W. Norton & Company, 9780393064667, 387pp. Nearby, his father, an eminent author, taught on a college campus and took the kids out on Sundays. The clash of worlds between town and gown, between the hard drinking, drugging, and fighting of "townies" and the ambitions of well-fed students debating books and ideas, couldn't have been more stark or more difficult for a son to communicate to a father. Only by finally putting pen to paper himself did young Andre come into his own, discovering the power of empathy in channeling the stories of others--and ultimately bridging the rift between his father and himself. 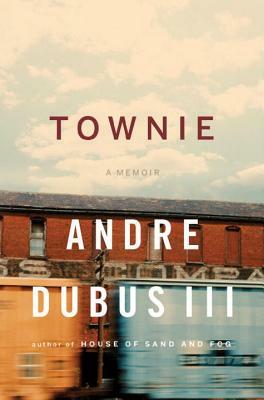 Although the chronology of Dubus’s memoir spans his life from young childhood until 1999, Townie opens with a vignette from his adolescence, in which he goes long-distance running with his father. Why does Dubus begin his story with this particular event? What do we learn from this scene alone about Dubus’s life? Although Andre’s father was a writer known for the insight and empathy expressed in his fiction, he seems clueless about his children’s day-to-day suffering. His mother is also largely unaware. Why? Celebrated fellow writer Richard Russo describes Townie as a “meditation on violence.” In what way is that so? What did you find most impressive or moving about Dubus’s descriptions of violence in the book? What are its “terrifying pleasures”? Dubus often expresses his recollections tentatively, using language like “probably” and “maybe.” What does this reflect about Dubus’s relationship with his own memories? How does this influence your own attitude toward the book and the author? Andre and his siblings escape their bleak home lives in different ways: Suzanne with men, Jeb with music and art, Andre with weight training and fighting, and Nicole by locking herself away in her bedroom. Were there other coping strategies they could have used? Why were these the ones they each chose? Dubus writes in great detail about numerous carpentry and construction projects—from building a tree house with Jeb as children to their work with a housing contractor as adults. What role does the act of construction play in each of the stages in Dubus’s life? How might it suggest a response to his parents’ way of being in the world? Between inertia and throwing the first punch, Dubus writes, “You have to move through two barriers . . . one inside you and one around him, as if everyone’s body is surrounded by an invisible membrane you have to puncture to get to them.” What about puncturing the “membrane” appeals to Dubus? What causes him to seek it out over the years? How would you describe Andre’s father’s interest in his son’s strength and potential for violence? What is that about? What does the book say about the origins of violence? About its consequences? Its possible cures? What is the role of privilege in the book and in the lives of the Dubus family? What does the book say about the relationship between the haves and the have-nots in society as a whole? What are the different ways of “being a man” explored in Townie? How did Andre, his father, and his grandfather each answer the question of what it means to be a man? How did both Andre and his father revise their definitions over time? What separates Andre and his father and what brings them together? How do various people in the book manage to reconcile with one another? What role do sports—running, boxing, and baseball, specifically—play in Townie? When Andre’s father’s legs are crushed in an automobile accident, Andre teaches him about bodybuilding and shadowboxing in an effort to help him recover his strength. In what ways does the accident change their relationship? Why, given their past, do Andre and his brothers and sisters all rally around their father after his accident? What holds this family together?